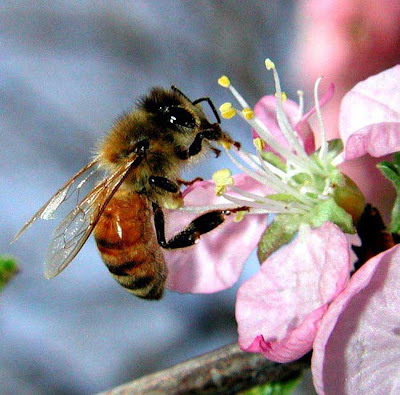 Honey bees have had a tough ride of it over the past couple of years what with Colony Collapse Disorder (CCD), indiscriminate insecticide use, and the varroa mite. The trouble is this, not only are these worrying factors having a severe impact on bee populations, there will eventually be a terrible ’knock on’ effect on the production of the very food we eat. In certain areas of China, the local people are already paying the price for indiscriminate insecticide use which has devastated the natural populations of pollinating insects. Nowhere has been more affected than the pear orchards of southern Sichuan whose bizarre story should be a frightening lesson to us all. By the end of the 1980’s bees were effectively wiped out from this area forcing local farmers to scrub pollen from the pear trees, dry it, and then carefully dust it onto each pear blossom by hand. This incredibly slow and laborious task is still carried out each spring with thousands of rural residents taking to the trees clutching makeshift step-ladders and feather dusters. In the spring of 2008 around one third of honey bees were lost in the UK, and while it’s not entirely clear what had caused this massive population drop, if such losses continue it will have a devastating effect on the country's crop production. Such figures have also brought to light the importance of native English bumble bees to crop pollination should honeybee populations eventually crash. There used to be about 27 species of native bee within the UK, but with the introduction of intensive farming after the Second World War about 95% of natural flower-rich pasture land was lost to us when it was turned over to edible crops. As a result of this, two species of our native bees have already become extinct while general native bee populations are in decline. If - at the very least - native bumble bee populations can be sustained, then at least there is some hope for the future of UK crop production. However for a more 'fruitful' future, steps will need to be taken to allow more land to return back into its natural 'wildflower' state, and for pesticide use to be more closely regulated.